It seems like not that long ago, I was telling you about the release of Google Earth 4. 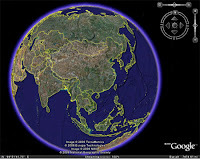 Well, lucky for you, Google has been on top of their game and they just released the next version, Google Earth 5. The new Beta version has some really cool new features you just have to check out! If you've used Google Earth before, you probably already know about many of the features, such as being able to look up anywhere on the planet and see awesome aerial satellite photos. Well, version 5 even introduces something you've never seen before! With Google Earth 5, you can go below the ocean and explore the sea floor. How cool is that?! Other than looking into the ocean, you can also look into the past. With the new version of Google Earth, you can click on the clock icon and see how places looked in the past and how they have changed over time. That feature is awesome for looking at progress while something was being built, such as a stadium or sky scraper. If you think you might like all of the new features, you can check out Google Earth 5 for yourself right here. Enjoy!